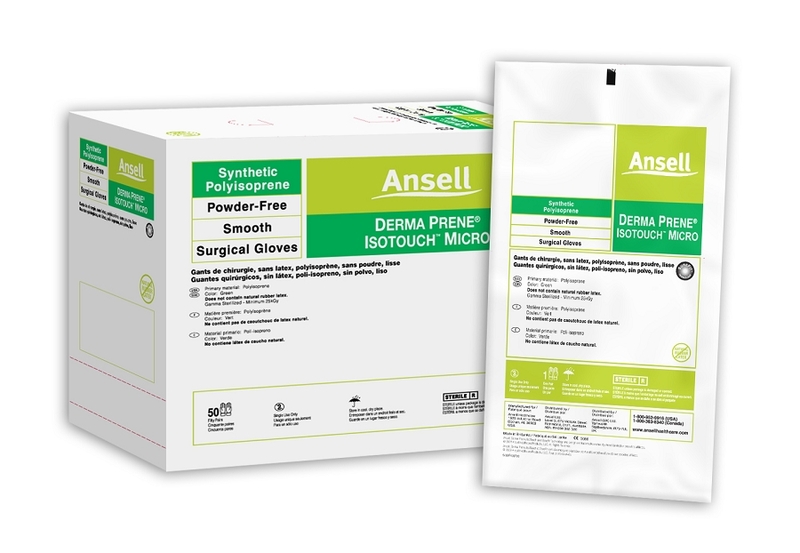 The Derma Prene IsoTouch Micro synthetic polyisoprene, powder-free surgical gloves offer exceptional dexterity, tactical sensitivity, and at the same time, outstanding strength and barrier protection. The Derma Prene IsoTouch Micro is ideal for delicate procedures in ophthalmic, micro, and cardiovascular surgery without the risks associated with natural rubber latex sensitization. The Derma Prene IsoTouch Micro can also serve as an underglove. Its micro-thickness allows for comfortable double-gloving. The Derma Prene IsoTouch Micro is green in color for instant identification as a natural rubber latex-free glove, which helps to reduce confusion and risks to those allergic to natural rubber latex. Ansell’s healthcare division offers a full range of surgical and examination gloves covering all applications, as well as healthcare safety devices and active infection protection products - designed to best suit a variety of needs while protecting patients and healthcare workers alike.